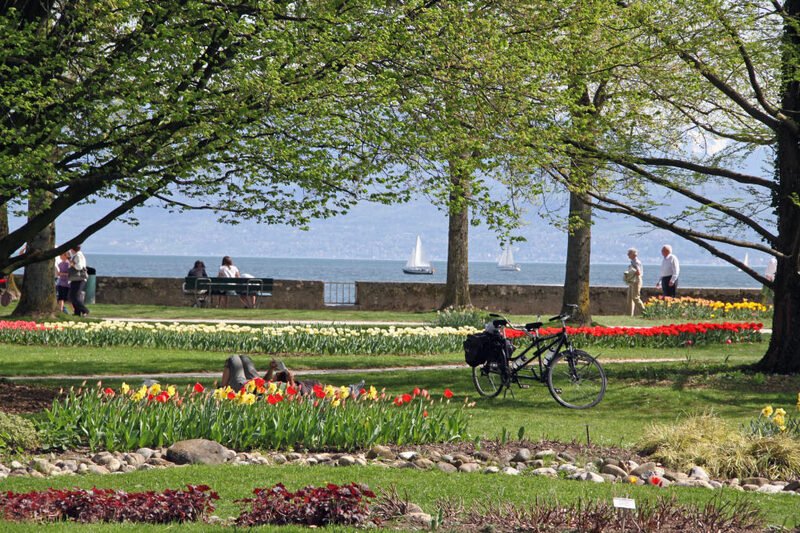 Each spring, Morges holds a Tulip Festival (Fête de la Tulipe) in a lovely shady park on the shores of Lake Geneva. Around 150,000 bulbs, including around 300 varieties of tulips, are planted in Morges’ Independence Park to provide one of the best spring photo opportunities in the Lac Léman region of Switzerland. The festival is held each year from mid-April to mid-May but as the public park is always open, visitors can enjoy the tulips whenever nature deems the bulb plants fit to bloom. The 300 varieties of tulips – as well as the use of daffodils and hyacinths as back up flowers for cold weather – allow tulips and flowers to be in bloom for most of the festival period. The photos of the Morges Tulip Festival below were taken mostly on April 10, 2011 – a year when unseasonably hot and sunny weather allowed the tulips to be spectacularly beautiful very early during the festival period. See Visit the Free Morges Tulip Festival on Lake Geneva for more visitors’ information.